Peppers are a long-season crop that are subject to early and late season weed issues. These trials focused on layby applied herbicides to reduce late season weeds. Dacthal, Dual Magnum, Prowl H2O and a combination of these treatments are registered for use on peppers and were included as standard treatments. Outlook, Chateau and Broadstar were tested as non-registered alternatives. The Chateau treatments were tested at 3 and 6 ounces, and on the Coast Broadstar was tested at 37.6 lbs/A, which is the same amount of flumioxazin as 3 ounces of Chateau (0.093 lbs a.i./A). 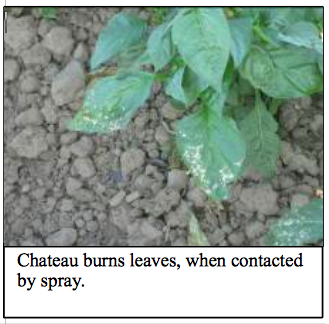 Chateau was applied as a directed spray towards the base of the plant (some did contact the bottom leaves), as a shielded spray (to avoid contact with bottom leaves, although some did) and as a directed spray with the water repellent adjuvant DC-6184 (to reduce phytotoxicity of leaves that come into contact with the spray). 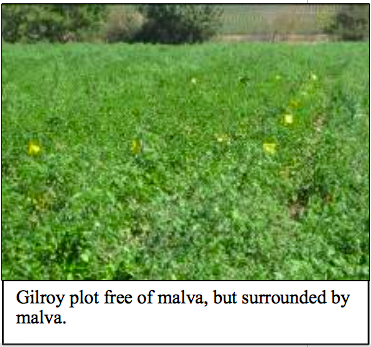 Mallow was a predominant weed in the Coast trials, but not in the Central Valley Trials. The Coast trials indicated that directed or shielded sprays of Chateau gave excellent control of little mallow, but currently registered herbicides, Dual Magnum and Prowl H2O, did not. 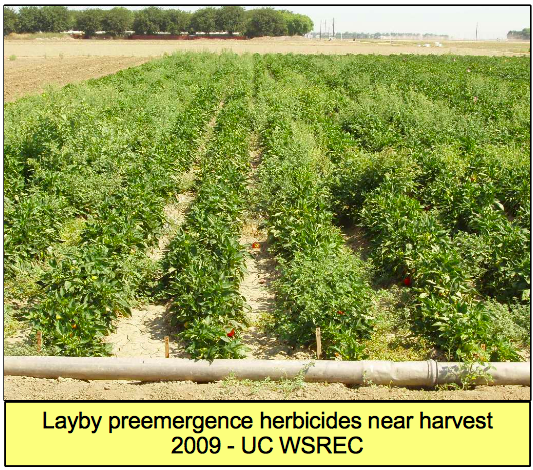 In the Central Valley trials nightshades, pigweeds, purslane, lambsquarters, and puncturevine were predominant weeds and excellent results were obtained with several of the layby applied preemergence herbicides. Continued efforts need to be researched to keep the spray of Chateau off of pepper leaves during application to improve crop safety. A granular formulation of flumioxazin, such as Broadstar, has the potential to deliver the chemical to the soil surface with little to no phytotoxicity to the crop. Peppers are long-season vegetables that have a number of herbicides registered for use; however, the preemergence herbicides registered for peppers have gaps in the spectrum of weeds that they control (Smith et al., 2008). As a result, growers may spend significant amounts of money throughout the season to control weeds in peppers. Dual Magnum was registered in 2002 and provided a tool to control hairy nightshade (Solanum sarrachoides) and yellow nutsedge (Cyperus esculentus). In 2008 the wording of the Dual Magnum label was reworked and now it clearly states that Dual Magnum is registered for use at layby in peppers. Also in 2008, Prowl H20 was registered for use on peppers for use at transplanting and at layby. These two herbicides provide solid tools for controlling weeds in peppers. However, given the long growth cycle for peppers, late season weed control continues to be a problem on pepper grown without plastic mulch. Layby Herbicide: Effective layby herbicides would provide effective weed control later in the season and reduce late-season weeding costs. Dacthal is registered for use to control broadleaf weeds at layby in peppers, but several warm season species are not adequately controlled for a sufficient length of time. It was used on only 0.6% of the acreage in 2000 (CPIAP, 2000). The low use of Dacthal may be due to its high cost, but given the high cost of hand weeding, it is still not clear why this material is not used more in peppers to provide weed control deeper into the growing season. Dacthal is partially effective against hairy and black nightshades. The clarification of the Dual Magnum label and the registration of Prowl H2O in 2008 have greatly improved the layby options for peppers. Prowl H2O provides an excellent option for controlling many broadleaf weeds such as lambsquarters, nettleleaf goosefoot and mustards; however, it is not effective against the nightshades or yellow nutsedge. Dual Magnum controls a similar weed spectrum to Prowl H2O, but is also effective against hairy and black nightshade and yellow nutsedge, but not puncture vine. None of the currently registered layby herbicides are effective against malva (Malva parviflora) or field bindweed. Other Weed Control Options: We have examined Outlook (BASF) as both an at-transplant and layby applications for pepper. In some trials it caused significant stunting of peppers, when applied over-the-top of the peppers. It seems a better option is to apply it as a directed spray to peppers at layby. It is effective against yellow nutsedge and we think it worthwhile to continue evaluations of this material. Other materials that we have evaluated but have discontinued evaluating due to lack of interest by the manufacturers or to unacceptable phytotoxicity include: Goal Tender (Dow AgroSciences), Chateau (see below) and V-10142 (Valent Corp.), Matrix (DuPont Corp.) and Spartan (FMC Corp). The goal of this research is to develop a weed control system which provides a good measure of weed control for late season weeds in peppers. From 2004 to 2008 this system was tested in two pepper growing regions that have different weed pressures: 1) the Coastal production district that has nightshade and malva, and 2) the Central Valley production district which has annual morning glory, field bindweed, fleabane and marestail, knotweed, nightshades and ground cherry, nutsedge, pigweeds, purslane and puncture vine. Central Coast: Trial No. 1. Trial was established in cooperation with Jim Guidotti and Kevin Vaughn west of Soledad. Peppers were direct seeded in mid-April; the variety was a proprietary dehydrating chili type. The peppers were hand weeded and cultivated on June 25. Layby weed control applications were made on June 27; sprinkler irrigation was used to set the herbicides and was applied on June 30 (weather was in the low 80ís on June 27, but cooled to the mid-70ís the subsequent days prior to first irrigation). Each plot was one 80-inch bed wide by 10 feet long and replicated three times in a randomized complete block design. Two application methods were assessed: 1) a spray directed to the base of the plant and 2) a spray applied with shields to avoid contact with the base of the plant. There were 5 seedlines on each bed and 6 passes of a single nozzle spray tip (8008E Teejet at 30 psi) were made to cover the area between the seedlines and both sides of the bed. All materials were applied in the equivalent of 103 gallons of water per acre. The granular material, Broadstar, was applied by shaking the material from a container over the surface of the soil. Yield was evaluated by harvesting all fruit from 15 plants; there were few culls or green fruits (the field had been treated with etheral) and only marketable yield was measured. Soil type at the site was Metz fine sandy loam. Trial No. 2. Trial was established in cooperation with Paul Mirassou east of Gilroy. The pepper variety Baron was transplanted on June 18. Peppers were grown in double rows (1 foot apart) on 40 inch beds. Layby weed control applications were made on July 7; the herbicide was set with water from drip irrigation that was applied to the middle of the bed between the two seedlines (no sprinkler irrigation was applied). Each plot was one 40-inch bed wide by 20 feet long and replicated three times in a randomized complete block design. 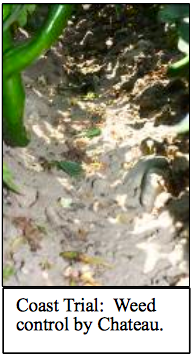 Applications were applied as either directed or shielded sprays to the area between plant rows. Three passes were made to cover the area between the seedlines and both sides of the bed with a one nozzle wand with an 8008E teejet nozzle at 30 psi. All materials were applied in the equivalent of 103 gallons of water per acre. Yield was evaluated by harvesting all fruit from 15 plants and sorting reds, greens, breakers and culls. Soil type at the site was Campbell silty clay loam. See table for treatments and evaluation dates. Central Valley Trial Methods: A field trial was conducted at the UC West Side Research and Extension Center in Five Points in Fresno County. Soil type is a Panoche Clay Loam. On March 27, 2009 the bell pepper variety "Jupiter" was transplanted in single rows into 40" beds using a commercial transplanter. Within row spacing was 9" between plants and stand establishment was excellent. Weed pressure was great and there was no preemergence herbicide applied at planting. At layby the entire field was mechanically cultivated and handweeded so that the layby preemergence herbicides could be applied as treatments. Plot size was one 40-inch bed by 70-feet of row. The sprayer was a CO2 backpack sprayer at 30 psi with a two nozzle wand outfitted with 2 XR Teejet nozzles 8003 evs and a water volume of 30 GPA. Drop nozzles and plastic shields were used as needed for the application method of directed spray and shielded spray. The layby treatments were applied on May 27, 2009 with weather conditions of 70? F average temperature, partial cloudy skies, and wind less than 5 mph. Nightshades (hairy, black, and groundcherry), pigweeds (prostrate, redroot, & tumble), lambsquarters, purslane, London rocket, puncturevine, shepherdspurse, barnyardgrass weeds were the main weeds. The field had a lot of volunteer wheat growing with the pepper crop prior to the layby cultivation, but afterwards there were virtually no grasses. Phytotoxicity ratings were taken 15 days after the layby application and at harvest. At harvest individual weeds were counted for the full length of the plot on the bed top. Each plot was also evaluated for an overall weed control rating based on a scale of 1-10. On July 29 15 feet of row was harvested and sorted into size and quality. Small through extra-large fruit are reported here; culls and rotten fruit are not shown. Central Coast: Trial No. 1: There was no to slight phytotoxicity observed on the Prowl H2O, Dual Magnum, Prowl H2O+Dual Magnum and Outlook treatments on the five evaluation dates (Table 1). The Chateau treatments had varying levels of phytotoxicity, but generally there was higher phytotoxicity at the 6 ounce rate than at the 3 ounce rate. On the first evaluation date there was lower phytotoxicity with the shielded application over the directed application and the directed application plus DC-6184; however, that trend did not persist over the other evaluation dates. Shepherdís purse, hairy nightshade, malva and lambsquarters were the primary weeds at this site. All of the weed control materials reduced total weeds significantly on the July 14 evaluation date (Table 2). The Chateau treatments were effective against all weed species in the trial. Prowl H2O was weak on nightshade. The same pattern was observed on the July 24 evaluation date. On the August 11 evaluation date the level of weed control began to decline in the Dual Magnum, Prowl H2O and Outlook treatments (Table 3). The Chateau and Broadstar treatments continue to have low numbers of weeds. There was more malva emerged on the August 11 and September 2 evaluation dates and all Chateau and Broadstar treatments provided good control of this weed. Total weeding time was reduced in all herbicide treatments (Table 4). Dual Magnum, Prowl H2O and Outlook were significantly lower than the untreated. All Chateau and Broadstar treatments had the lowest weeding time. In general, the 6 ounce rates had lower weeding time than the 3 ounce rate. There were no significant differences in yield among the treatments. Fruit yield per plant varied from 0.927 to 1.136 lbs of fruit per plant with individual fruit weight between 0.102 to 0.119 lbs/fruit. Trial No. 2: All Chateau treatments had greater phytotoxicity ratings on July 15 than Dual Magnum or the untreated check (Table 5). There was a trend indicating that the 3 ounce rate had less phytotoxicity than the 6 ounce rate. All Chateau treatments had fewer weeds on the August 19 evaluation date. This was largely due to better malva control. The same trend was observed on the October 1 evaluation. There were no differences in yield among the treatments (Table 6). Results Central Valley Trial: Phytotoxity ratings (Table 7) taken 15 days after spraying (July 11) and at harvest (July 29) revealed no herbicide injury from spraying Dacthal, Dual Magnum, Prowl H2O, or Outlook. The Chateau treatments had varying levels of slight phytotoxicity, but surprisingly these were not severe. In general the higher rates of Chateau whether applied as a directed, shielded, or with the water repelling adjuvant and directed spray, caused slightly more damage to the peppers, but this did diminish over time and had no effect on yield. There was no significant difference in pepper yields as a result of the herbicide sprays. All layby herbicide treatments were significantly lower in weeds than the untreated check plots (Table 8) and provided adequate weed control (>7.0). It is surprising that with so many weeds present at harvest in the untreated check that there was no drop in pepper yield. Certainly without a layby cultivation there would have been virtually no yield, but a timely layby cultivation allows peppers to set fruit, and then as new weeds germinate and grow the weeds provide some shade to the developing peppers. Dacthal provided very good weed control over all broadleaf weeds that were present in this trial. In previous studies it has been less consistent. Dual Magnum and Outlook did not perform as well as they have in past trials conducted in peppers at the field station. Weed control was adequate, but many nightshade, lambsquarters, and purslane weeds escaped control. It is known that Dual Magnum only partially controls lambsquarters and this field was carrying a high population of lambsquarters, but regardless it is usually more effective on the other mentioned weeds. Prowl H2O provided excellent weed control of all broadleaves in the field and the barnyardgrass. When Prowl H2O was combined with Dual Magnum, weed control was further improved. The higher rate of Chateau provided very good control of the nightshades, lambsquarters, and pigweeds. There was too much variability in the field to know if directed versus shielded versus applying an anti-wetting agent with Chateau affected the weed control, the phytotoxicity, or pepper yield. Table 2. Central Coast: Trial No. 1. Weed counts (weeds per 6 sq. ft) on two dates1. 1—Other weeds not included in this analysis, but that are included in total weeds are woodsorrel, sow thistle and Mexican lovegrass. Table 3. Central Coast: Trial No. 1. Weed counts (weeds per 6 sq. ft) on two dates1. Table 4. Central Coast: Trial No. 1. Weeding time evaluations (hours/Acre) on two dates and harvest Evaluation on October 20, 2009. Table 5. Central Coast: Trial No. 2. Phytotoxicity rating on July 15 and weed counts on two dates. Table 6. Central Coast: Trial No. 2. Yield evaluation (per 15 plants per plot) on October 1, 2009. Table 7: Central Valley: Phytotoxicity Ratings and Yield of Peppers with Layby Herbicide Treatments. Table 8: Central Valley: Weed Counts (weeds/70' row on the bed top) at harvest (July 29, 2009). ** Means followed by the same letter are not statistically different from each other.